Yesterday I spent a part of the day purging and trimming down my old files full of tear sheets and old magazines. Of course I kept my favorite pages of fashionable shoots from the past fifteen or more years. One particular favorite shoot was from an old Harpers Bazaar depicting models in haute couture out on the range. I absolutely loved the mix of luxe and covered wagons…original and seamlessly done. I wonder too if Derek Lam might have been thinking about a home on the range with his Fall ’10 cowboy chic collection? Lam’s collection was a brilliant mix of cowboy charm with city chic. I loved the caramel colored coats and black and white palette. Beyond the hate and props these pieces looked uber luxurious and wildly feminine but most importantly the tailoring was exceptional. Of course I could not pass up the opportunity to dish on The Row. I have made no secret about how much I swoon over Mary Kate and Ashley’s line. And once again the duo has made an impeccable collection, as always a short but equally sweet list of pieces. As with most collections this season there was no shortage of black and white, but the girls added one more shade…blue, mostly navy and mostly denim. The pieces are as expected minimal, edgy and low-key. The famous tee’s always abound, as do the silk and leather pieces. I say run don’t walk when the line arrives at a Barney’s near you! Next up Narciso… what can be said about this genius of a designer that hasn’t already been said? The form and lines are to die for, no really. These are the clothes that make the woman. This season Rodriguez played with curved lines and shadows, the dresses had cropped and fitted bodices, jackets were bell’d and belted but it’s always the finer details of construction and trims that make NR a show stealer. Again a mostly black show was lightened up with pops of deep green and bits of orange and white which seem to be the colors that ran rampant through the Fall forecast. As a lover of black and white I say bring it on…the easier the dress myself with my dear! 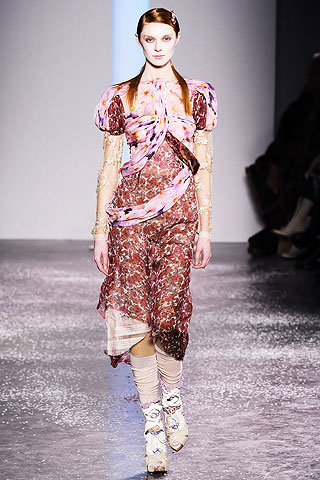 Lastly Rodarte by the designing duo- sisters Kate and Laura Mulleavy was as creative as always, and would we expect less? Visions of Juarez Mexico surely influenced team Mulleavy as native arts and crafts details showed up in a variety of ways from vintage lace, to burned out velvets and native inspired prints. While other lines chose to go practically monochrome this season Rodarte bucked the trend infusing color throughout the collection. Though not for everyone, the fashion adventurous will surely have a field day with these not- for -the- wallflower looks. 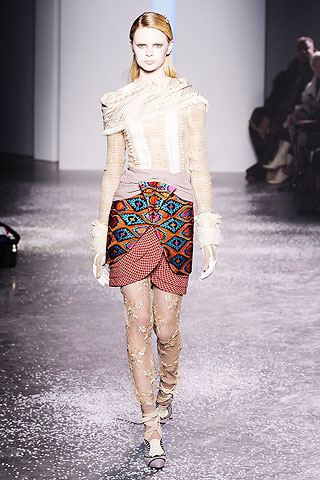 Paris Fashion Week Reviews – Galliano and Stella McCartney! Those are some wild prints.